I posted here about the evolution of the Lauderdale County Court House, which included various historical photos of the building. 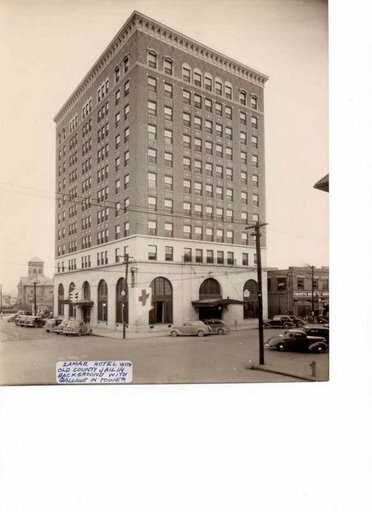 Below is a photo of Meridian looking east-southeast, obviously from a vantage point in the Threefoot Building, Meridian’s 16-story Art Deco icon, which had been built in 1929. The Lauderdale County Court House is the domed, Beaux-Arts-style building in the right center. The photo had to have been taken before 1939, because that is the year when the WPA work removed the dome, replaced it with a squarish jail, and transformed the façade from Beaux Arts to Art Deco. The photo, then, had to have been taken between 1929 and 1939. If you compare this photo to some in the prior post, you will notice that the statues that originally adorned the court house roof above the west-facing columned entrance are removed. The Confederate memorial has been installed on the northwest corner of the lawn. 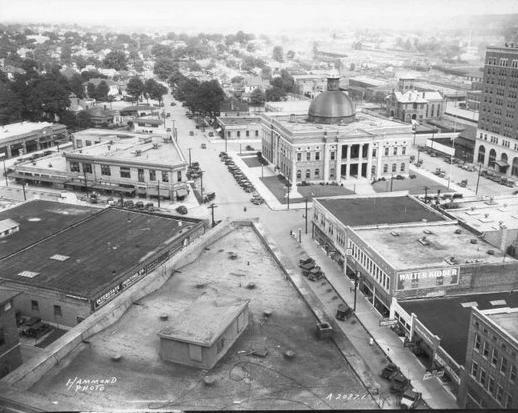 In other details of the photo, look to the right of the court house, east of and about a block from the Lamar Hotel building, and you will see the old jail that predated the one installed atop the court house during the WPA renovation. You will also notice the residential neighborhoods to the east that extend in this photo within a block of the court building. I imagine some of the more everyday lawyers strolled to work from home in those neighborhoods back when this photo was taken. The more prosperous barristers lived in the mansions along Eighth Street, or around Highland Park, or in the ample residences on Twenth-Third and Twenty-Fourth Avenues. 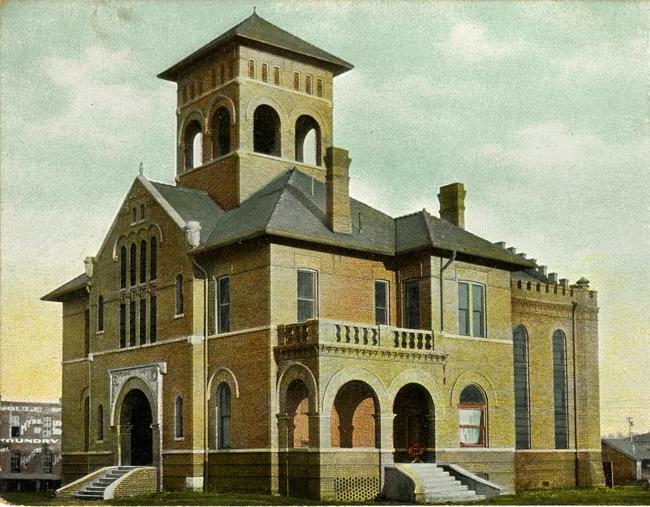 Here is a post-card photo of the jail building. Notice the Soulé foundry building to the left (east) of the jail. Its location will give you a clue as to the site of the old jail. And below is a photo of the Lamar Hotel looking southeast, with the jail to the left, or east. Notice the caption, “Lamar Hotel with old County Jail in background with gallows in tower.” Before the state employed a travelling electric chair, executions for capital offenses were carried out in the various counties by hanging. Meridian, in forward-looking fashion, had a permanent gallows for the purpose, rather than having to go to the expense of constructing an ad-hoc apparatus as the need arose. Even back in those days, Lauderdale County had innovative leadership. You are currently reading MORE HISTORY OF THE LAUDERDALE COUNTY COURT HOUSE at The Better Chancery Practice Blog.